Ticker Tape is a simple way to broadcast unobtrusive messages to workstations spread over one or more sites - it\'s ideal for Help Desks or Administrators wanting to proactively advise people of issues affecting one or more locations. Ticker Tape is a simple and cost efficient way to \'broadcast\' unobtrusive, yet highly visible, messages to workstations spread over one or more Sites, without impacting the users normal work.It\'s ideal for Help Desks or Administrators wanting to proactively advise people of new issues or to update them on the progress of current issues affecting them - helping to substantially reduce the number of unneccessary calls coming into the Help Desk during system failures to re-report the issue or request a status update, allowing them instead to concentrate on the normal steady stream of \'business as usual\' queries. 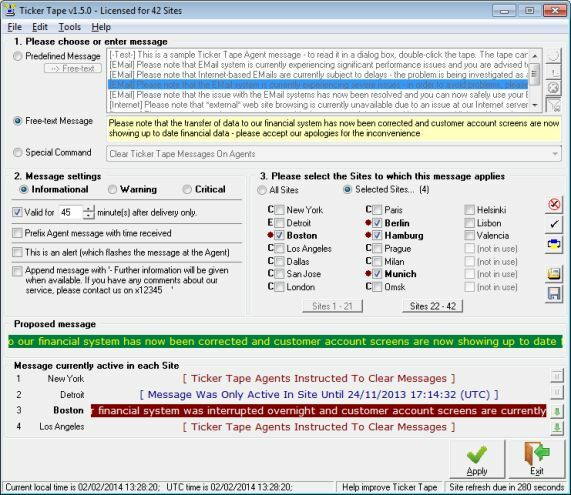 It\'s intuitive Administrator interface allows you to choose from a range of predefined messages, construct your own or control the behaviour of the Agent software and the messages displayed which can be setto expire automatically after a set time, include standard help text by default and indicate their criticality by colour. The free unlicensed version is functionally identical to the licensed version other than it can only manage the Agents on three different Sites (however, each Site could contain thousands of Agents), allowing you to fully test Ticker Tape in your environment for as long as you wish before deciding whether to buy a license to enable additional Sites. Installation of the license is as simple as pasting the received license key into your currently installed version of TickerTape to immediately enable the additional sites. MediaHeal for Virtual Drives recovers files from damaged virtual disks (.vhd, .vmdk). Supported virtual drive formats: VMDK, VHD, IMG, OVA, XVA with FAT or NTFS file systems. The recovered data is saved into a new user-selected location.